I've been a Disney fan since birth. The movies, the stories, the theme parks, the songs- I love it all. My mom has been a cast member for as long as I can remember and I've been strolling down Main Street U.S.A. since I learned how to walk. I grew up in central Florida and only knew Walt Disney World as my Disney home until April of 2015 when I came to Disneyland for the first time. Since then, I moved to California and have been a Disneyland annual passholder for the past six months. I get asked the same question pretty often now which is, "Do you prefer Disneyland or Disney World?" And to that, I have one easy answer- Disneyland. Let me tell you a few reasons why I love this place! At Walt Disney World, I feel like your quick service food selection includes three options- cheeseburgers, chicken nuggets, or pizza. Yes, there are exceptions to this rule, but 8 out of 10 times, you will find those options in most quick service restaurants across Disney World property. Now let me share the yummy and affordable quick service meals I've eaten at Disneyland. Where do I start? Creamy corn chowder in a bread bowl (with Mickey ears), a pork and cheddar sandwich with caramelized onions, BBQ pork ribs with some of the best mashed potatoes I've ever eaten, and a thick grilled cheese with an amazing bowl of tomato soup. There are so many options when it comes to inexpensive food at Disneyland for all kinds of tastebuds! The quick service restaurants offer a different variety of foods while the rest of the park has snack carts sprinkled everywhere. One of my favorite snacks is the garlic cheddar bagel twist in Fantasy Faire along with the gourmet donuts right around the corner in front of Sleeping Beauty's castle. Whatever your tummy wants to eat, you can find it at Disneyland! In six months, I haven't seen one tour group walking around Disneyland. Crazy, right?! At Disney World, it's normal to see cheerleading groups, Brazilian tour groups, and 30+ people walking around as a tribe for their annual family reunion. While Disney World does have more space to accommodate these groups, it's so nice to not deal with as many crowds at Disneyland. There are busy times just like every amusement park, but on a day to day basis the lines and crowds are much smaller at Disneyland than Disney World. Plus, they still have the paper FastPass system which I LOVE taking advantage of rather than booking my FastPass+ online months ahead of my trip. Relating to crowds, there's also very short lines for character meet and greets in the parks. I've also ran into countless characters while they're walking from point to point. Yes, they'll actually stop for pictures in Disneyland! Walt Disney never stepped foot in the completed Disney World parks. While the Magic Kingdom absolutely feels like a Disney park, there's something extra special about Disneyland. 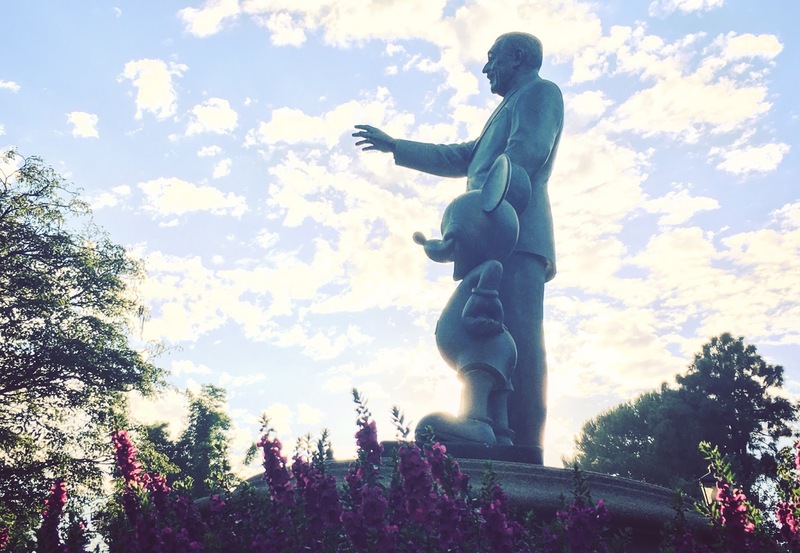 To know that Walt walked down Main Street U.S.A. and saw his dreams become a reality gives me goosebumps. There are little pieces of history scattered around the Disneyland park that all nod to Walt himself. The lamp that is always lit above the fire station? That's a tribute to his legacy as that room above the fire station was his private apartment. This brick wall at the end of Center Street may look a little wonky at first, but the history behind it is significant. The wall was made to test different masonry designs which finally got the thumbs up or thumbs down from Walt himself. It houses a water fountain now, but I love knowing that this was originally created as a test for the final look of all the bricks throughout Disneyland. Before you walk past the theater on Main Street U.S.A., take a little peek behind the curtain and walk inside. It's one of my favorite hidden gems because most people think it's just a facade. When you step around the curtain, you'll see that it's actually a little theater with the classic Mickey Mouse cartoons playing on various screens all around you. Oh, and it's air conditioned. Perfect little cool off spot during the summer. Disney World enthusiasts- how would you react if I told you there was a place where you can park hop in less than 60 seconds?! That place is Disneyland! You can park hop from Disneyland to Disney California Adventure in just a matter of seconds. No buses or boats needed. Just a few steps and you are in another park. It's amazing. Also, imagine only having to go through security/bag check once throughout your entire day. That's right, you only have to go through security once and then you can enjoy both theme parks and Downtown Disney all day without having to deal with security lines again. Now with all of that being said, I will admit there are two very special things that I miss about Walt Disney World. The first is the legendary hub grass. I can't tell you how many times I've laid in the hub grass in Magic Kingdom to catch up with friends, take a break from the crowds, or just sip on a lemonade from Casey's Corner. It's just a special spot where everything around you slows down a bit and you can absorb all of the things around you. The second thing I miss is EPCOT. The Food & Wine and Flower & Garden festivals were two of my favorite annual events, mostly because of the great food. At least I get my food fix on a regular basis here at Disneyland. Obviously both places have their perks, but Disneyland is something truly special. If you're a Disney fan, make it a priority to visit the original park whenever you can.